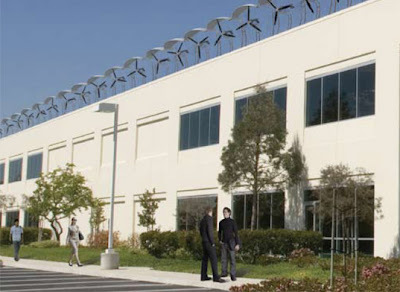 Not particularly focused on landscape per se, but the idea of building integrated wind is fascinating, and there are a bunch of interesting examples I thought I would compile here, with some minimal explanation. 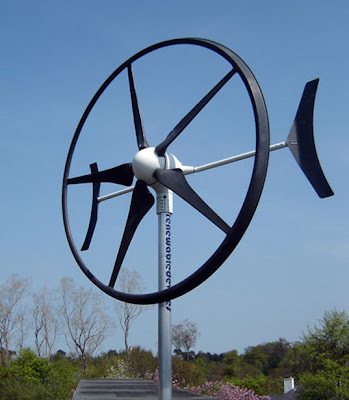 Much like urban ag, wind is a hot topic, specifically small(er)-scale turbines technology. Check these out. 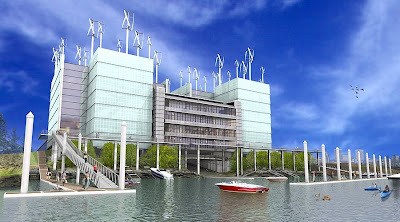 A Portland project for a new Boat Storage features some integrated wind, amongst a variety of other sustainable features (from Portland Architecture): "The project is also shooting for a Gold LEED rating and one of its distinguishing features is a series of vertical wind turbines and hopes to achieve a "net-zero" energy metering. 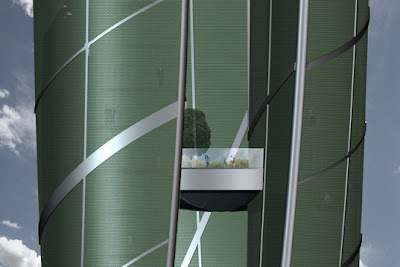 The project also will harvest its own rainwater to save 20,000 gallons of potable water per month, which will also be a visible part of the project as the two cut-out portions of the front facade will feature collecting pools for the rainwater that recall the upcoming World Trade Center memorial, "Reflecting Absence". It's also much better environmentally for the Willamette River to not have these boats rusting and leaking away in the water." 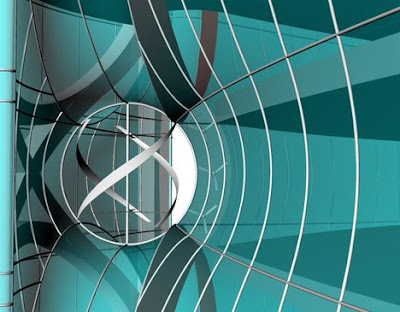 Via Inhabitat, a project with a lot of great ideas including the most integrated solution that combines wind, solar, and carbon dioxide reduction. 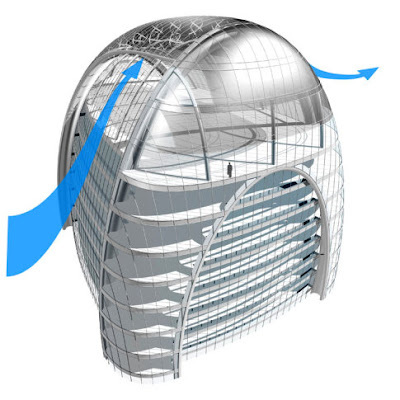 "The Nano Vent-Skin is a zero-emission material that takes a tri-partite approach towards energy efficiency. 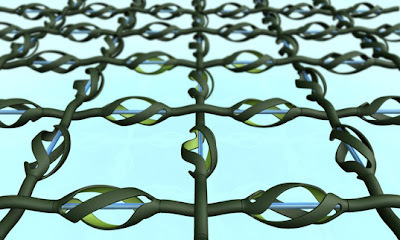 First, it soaks up sunlight via a photovoltaic layer, and transfers energy via nano-wires to storage units at the end of each panel. 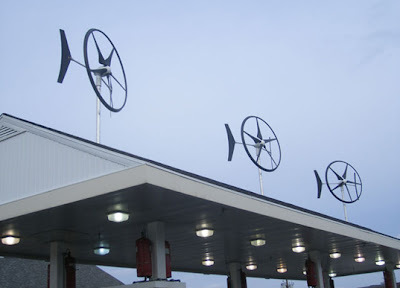 Second, its tiny turbines employ “polarized organisms” to create chemical reactions, generating power each time the turbine makes contact with the structure. 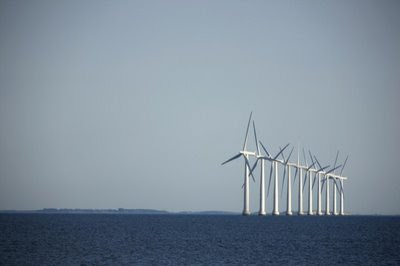 Third, the organisms present in the inner skin of each turbine soak up C02." There are also a bunch of great images of the tower, including the integration and how the skin looks from the interior and exterior. 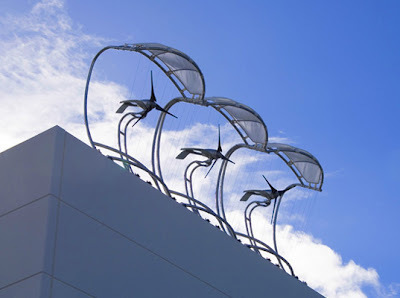 Another via Inhabitat, a smaller-scale variety... "The new Swift Wind Turbine is meant for rooftop residential or commercial applications and will be available in July of 2008." Treehugger had a much larger variety atop the central span of the Bahrain World Trade Center. 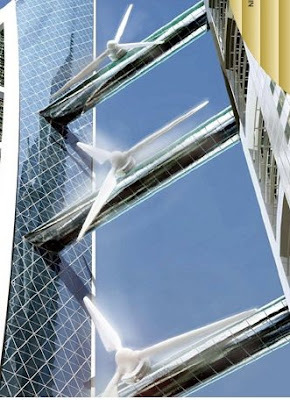 "The building's sail-shaped towers channel the strong on-shore winds directly onto the three 29m-diameter turbine blades, which are expected to provide 11-15% of the building's power when fully operational." Another couple via Jetson Green. 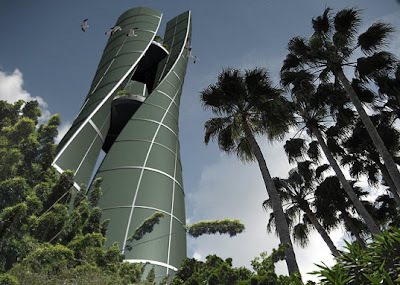 The first is a project from Smith Gill (formerly of SOM) "One of their newest projects, Clean Technology Tower, builds on principles of biomimicry and utilizes technology and building systems to interact with the surrounding environment." There are obviously a few issues with habitat surrounding wind technology and possible disruption (and mortality)associated with wind - mostly documented in larger scale wind farms. These issues will definitely need study to determine the local impacts for urban fauna... particularly in proximity to flyways, nesting sites, and waterways... will these smaller scale varieties have the same issues as larger-scale versions, such as this water-borne array in Sweden? 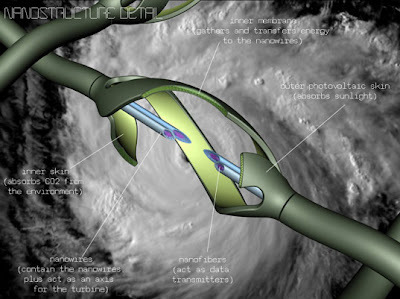 Also don't forget that urban wind is a complicated issue - there's turbulence everywhere, vibrations transferring to the structure, complicated electronics and a whole suite of regulations. 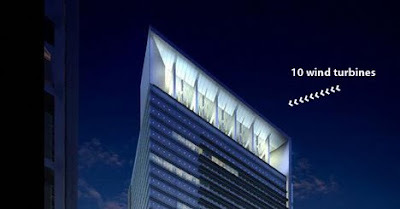 While not insurmountable, building integrated wind requires a serious level of rigour which I think few designers have been able to apply to their designs. Like vegetecture, it would be nice to see something move beyond the rendering. Thanks for the heads up on the SOM project... definitely a lot more integrated than some. My post was not to downplay the technical aspects - as there's a good reason we haven't seen wind power on buildings until recently... I agree - the rubber to the road in implementation will tell how viable, and how creative these are... will they be folded into building form, or tacked onto the side like some higher-end satellite dish?